Apple has been slow to support the myriad of LTE networks used by cell carriers around the globe. The company only supported Verizon and AT&T in the U.S., and several Canadian carriers when the LTE iPad launched earlier this year, leading to complaints over Apple's marketing of the device in a number of countries. Today, during the announcement of the fourth-generation iPad, Apple briefly displayed the above slide showcasing a number of domestic and international carriers that should eventually support LTE data on the new iPad and the iPad mini, and potentially the iPhone 5 as well. 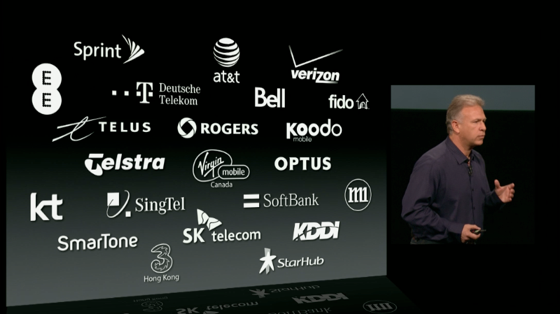 Currently, the iPhone 5 supports LTE networks on 17 carriers in 9 countries. For U.S. consumers, the new iPad and the mini will now support Sprint's LTE network. Additionally, Apple has posted a new page showing the 19 carriers in 9 countries that the iPad mini and 4th-gen iPad will support at launch. So it looks like buying the Verizon model gets you the most bang for your buck re: international coverage. Or in my case, I would want one to work in South Korea so I'd need to get the Verizon model. If I buy an iPhone 5 and LTE isn't available yet where I live (or it's a different type), will that mean it'll never be compatible? Or should I just wait and see if they ever release a compatible version of the iPhone? In Chile, the networks are rolling out 2.6GHz LTE now for launching mid 2013. In 2017, networks will roll out 700MHz using the APAC Band 28. Neither is supported in 2012 Apple devices. There is also almost no likelihood that a Chilean carrier would re-use "refarm" some of their existing 2G or 3G (850MHz or 1900MHz) spectrum. These frequencies are supported by today's Apple devices. I would expect 2600MHz support in 2013 Apple devices. 2600MHz has been auctioned off in many countries and some networks are already deployed using it. The chipsets that support all these bands are almost as impressive as the fine tuning of the antenna design that must go into every product. To be fair, LTE is bit of a mess and its going to be a few years before devices are available to cover all the frequency ranges and flavours of LTE that will ultimately appear. If you can, I would hold off on the 5 and go for the 5s which is more likely to have models supporting your required frequency ranges. Even so, you should only expect LTE support if the phone or device supports the LTE bands in use by your carrier today. Based on the experiences of friends who have tried international roaming with Verizon (wasn't pretty) I'm holding off until Apple unifies the LTE capability into a single model. I've done international roaming with both T-Mobile and AT&T with zero issue, and the last thing I need is having to trade off customer service (not exactly Verizon's forte from what I see in reviews) to get the overseas coverage. The entire point is to use a local SIM and not roam.